Are you on the search for a new job? You’re an experienced web designer and are interested in working with click.to? First, you start your research with a quick search on Xing. Highlight the COO name from the click.to “Our team” page, Ctrl+C, and select click.to Xing. Click.to opens Xing in a new browser page, logs you in and starts a search for Peter Oehler, all with one click. 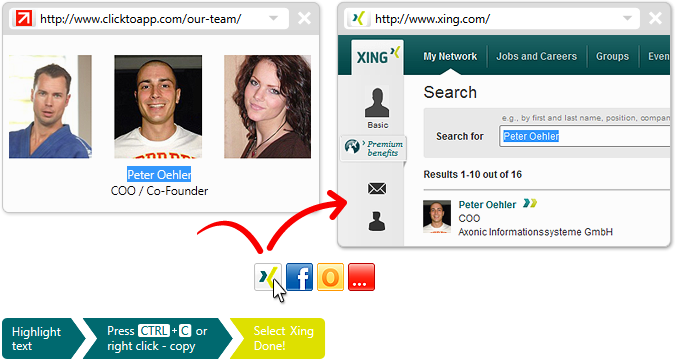 Finding a new job contact is easy, the only thing click.to Xing can’t do for you is the interview! Increase your business contacts with click.to Xing!